I went to Borders last night to find a new cookbook and instead came home with Going Against the Grain by Melissa Diane Smith. I started reading it right there at Borders, continued at home and then again on the train to work this morning. It's an excellent read for anyone that's ever had any sort of health problems, I highly recommend it. 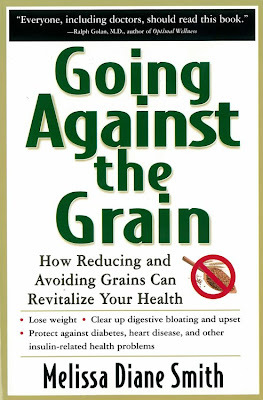 It completely re-affirms what I've already been thinking about the negative affects of grains on our bodies and how beneficial it is to reduce or eliminate them from your diet. I realize that this approach sounds drastic to many people, especially those that don't experience digestive issues or other health problems, but if you read this book I guarantee it will at least have a small impact on your thinking. I'm not trying to say that everyone in the world should get the grains out of their diets, just be conscious of the foods you eat and how they affect your bodily functions. I want more people to be aware of what's going on in this country and all over the world as far as drastic increases in health problems and obesity. It's no small coincidence that grains are the newest addition to the human diet. Because I suffer from so many issues, I am making every attempt to eliminate grains from my diet as I feel that it will make a drastic change to my health. I'm looking forward to not being sick and tired all the time.